Our first office was rented for a hundred dollars per month. Those were the days! Every new project was harder to get than the rest until we built a reputation. And this reputation is what we are now, what we’ll always be: the most dependable ally, the pioneers in new technological endeavors, the leaders in hypercompetitive environments. We grew and won against big consulting and PR firms because we understood early on that web development was a new business altogether. And now, our comprehension of dozens of industries and geographies along with state of the art technology make us even more relevant than in previous years. Our history of achievement is summarized in just one sentence: People first and profits later. A mantra that has served us well in these past 12 years! The Leslor Information Providers brand will be our business name abroad starting in 2015. Leslor is a short name that will instantly bring brand recognition to the firm. Locally the Information Providers logo and name will remain untouched. The shift to Internet Marketing came when we realized customers need traffic to their websites as much as they needed their sites developed! A new wave of services followed and little by little, we started packaging growth systems and traffic delivery solutions. Internet Marketing has turned into our most attractive competitive advantage. Now Information Providers is one of the local leaders in traffic delivery. We are trusted by the biggest corporations and by senior professionals who depend on our traffic delivery solutions to bolster their units performance. Our initial services only included web design, hosting and domain registration. We started with a team of three people: a designer, a developer and our producer. Later, we added more services, moved to bigger offices and now our firm offers consulting, custom application programming, grid technology, cryptocurrency and cloud solutions. We pioneered .Net development in 2003. Then Macromedia MX development in 2004. Actionscript, CMS development, Java, Rails, Multilingual CMSs, Coldfusion, Advanced CSS, PHP, HTML 5, Open GL and Hadoop came after. Now we’re programming in Node.js, MongoDB, Cassandra and Objective C. Our practice maintains that the only way to keep at the forefront of innovation is to be current on the latest tools and become an expert on them. In this respect, our founder directly produces most of the critical code and design of the firm, still to this day. Having such a senior expert craft the core of a system dramatically increases its security, cohesiveness and speed of delivery. We have become leaders in Application Development by carefully testing each and every framework that has gained relevant traction and then obsesively trained our specialists to maintain solutions and expand on the work performed by our producer. The future looks very promising indeed. IP is already a leader in cryptocurrency mining and development and we have now deployed a special task force to prepare package solutions so our clients can capitalize on the Internet of Things. Although we are ahead of the market by at least 4 to 5 years, this is what’s required of a leading technical consulting firm to deliver real competitive advantages to its clients. We take that compromise very seriously and are constantly fetching for new solutions that can bring more value and profits to our loyal customers. 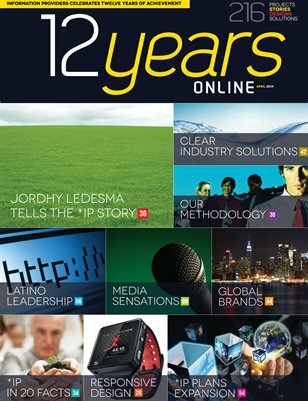 Read our 12th Anniversary Magazine for free or order in print via MagCloud! It seems like we started yesterday. Time flies incredibly fast. Especially when you love what you do. Our team is incredibly grateful to all our clients, partners, suppliers and friends who over the years have made our lives so much more valuable. Our firm is proud to have served more than 150 corporate clients in this decade, more than 200 completed projects are a testament of the quality of the solutions provided by *ip over the years. More importantly the many relationships we’ve built over this decade remain strong and have inspired us to keep innovating and pushing the cutting edge of technology. It is our sincere wish to continue serving our clients for another decade and expand our reach to more countries and regions. Stay tuned as *ip continues it’s international expansion! Give a man a fish and he’ll eat for a day, but if you teach him… If we create tools that empower our customers to deploy their messages on the web they’ll be able to make a bigger impact on society. 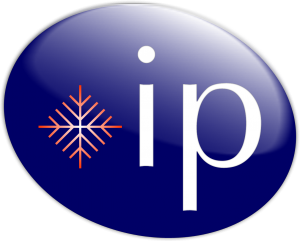 *ip is at a pivotal point in its history, we are transitioning into a product company of international impact. The success we had with the Portado brand and other *ip creations has opened our eyes to a new sea of opportunity in the consumer web sector. However, instead of solely focusing on this area, we’ll expand our consulting practice and open offices in potentially four more cities across the globe. We are now a leader in institutional web development, employing many professionals of distinguished track record and dedication. We’ll expand our reach by continuing to be a research-driven web development firm that provides targeted solutions to its customers. Our international play will be to focus on the Latino market of key geographies. The Hispanic market is growing as a faster rate than any demography in the US for example, this creates a big opportunity for us to establish offices in this country and recruit local designers and programmers that will, using our proven methodologies and research, deliver better solutions to the Latino demographic. This expansion represents an important conquest for our firm, in the coming years we will become one of the few Dominican brands with a direct international presence. This in turn will enrich our local practice with professionals from all over the world that will bring in a new perspective to our Latin American design mantra. As we prepare to grow we must look back and reflect on our values, our passions and core beliefs. Ours is a firm of hard earned prestige and a very respected brand in its key circles. But that comes at a price, because customers expect us to over deliver and be true to our promises every time. At *ip, excellence and achievement are not random events but a way of life. Our design perspective, which is colorfur, lively, and culturarly rich, pretty much like the Latino culture, is one of our key assets, and one we should maintain as we compete in bigger lands. Good news is, not much will have to change, as we’ve been competing against multinational agencies since our inception, so this transition should be a smooth one. On a different note, new develoments in the Internet make for an even more exciting future for us. Bitcoin and the cryptocurrency revolution will provide a fast, safe and cheap means to store and send money to the Latino community. The new wave of innovation that this represents will mean that a second Internet will surface: The Internet of Money. So, the next decade will be an exciting rollercoaster of technology with four Internets: Content, Social Connections, Things and Money. The Internet of Content will be primary consumed in tablet devices, via offline content-delivery techniques like apps, The Internet of Social Connections will welcome hyperlocal apps of greater utility and value, while the Internet of Things will connect every device that needs to be monitored by us. The Internet of Money will provide us with smart contracts, decentralized and stable cryptocurrencies and a parallel financial system available to anyone, globally. What this means is that the next decade will be the most exciting in technology in all of human history. We’ll see an explosion of information and utility that will provided us with a far more connected and far more fulfilling life. This means that boutique tecnology firms like ours will walk into a path of sustained growth and increased social relevance. Our technology, now used by millions, could possibly be used by hundreds of millions and, as Latin America becomes more connected and Internet savvy, our solutions become more useful and relevant to the world at large. These two trends, increase in connectivity of Latin America and the increase of the pervasiveness of the Internet present us with an unprecedented opportunity to make a difference and build a legacy of utility. And now, twelve years after its foundation, *IP emerges as a natural conduit for this new wave of innovation. Now, more than ever, we will help our customers embrace a new future, one of freedom, convenience and relevant information. We invite you to join us in this new ride, because the next twelve years will be much better than the last. OPTIMIZING THE DESIGN PORTFOLIO FOR IMPACT. In finance, is common to talk about optimizing the portfolio for returns. However, we tend to think more in terms of optimizing our efforts to achieve the maximum societal impact. That makes the whole team grow. Over the years we have designed for several impactful NGOs: the IDDI, Codespa, Cigar Family, UNESCO, ADOARH among others. The social value created by these projects has been surprinsing. To this day Cigar Family is still one of the most succesful ONGs of the country, Codespa has expanded operations and now serves Haiti, the IDDI is now managing thrice the amount of projects and the cultural compilations we’ve developed for UNESCO have doubled in visits since their creation. But the impact is not limited to numbers but also spans geographies. All of these projects have international impact and are browsed by dozens of foreing nations on a monthly basis. Seeing these projects grow represents both personal and societal gains. And we can now celebrate the magical way in which these projects have grown organically and beyond our wildests expectations. All ourprojects are indexed by archive.org and we constantly help in the dissemination of public information thru the Internet. It establishes a culture of sharing as well as an opportunity for societal growth thru education. Being based in Latin America means sharing both a culture of rapid growth as well as a conection to the ever increasing inequality that is hurting us so much. Thankfully our work can be seen in even the most remote locations using the least sophisticated computers. However, we shall make a compromise to keep helping these causes, realising that they make us grow farther than we expect of ourselves. Local NGOs deserve our attention because of the great work they have done for Haiti and the Dominican Republic. So let’s celebrate another decade of social compromise together! An *ip website must load fast, be 100% indexable by search engines and W3C compliant, however there are certain things that an *IP site has that very few other websites enjoy. For example, we use triple linking to get to each page, meaning that, in every website there are at least three distinct ways to get to each page. Furthermore, we use geometric grip spacings on every site, this makes for a much more pleasant viewing experience. *IP color palettes are usually monotones derived from Pantone compositions and the typography is, not always but usually, a sans serif composition. These and many other details make an *IP website stand out and convey a sometimes imperceptible allure that sets it apart from other productions. Like luxury watch makers we take to heart the accuracy, durability and convenience of our creations. The dominicancrafts.com website displays the art of an entire nation for the enrichment of the world and to ease trade and communication among developed nations and the D.R. Sponsored by UNESCO this website makes use of extensive *ip technology to capture visitor intent and provide accurate statistics to the editors. By using detailed metrics, group by art segment, editors can pick the best styles and artisans to showcase thus, increasing traffic and visitor satisfaction. We take care of the internal details and always perform unit testing, injection analysis, we place anti-phising measures in many websites and accurately monitor copyright and intellectual property breaches, We’ve never had a security problem in twelve years but sites produced by *ip are online 24 hours per day, just like every other. This is our pride, being state of the art even in the things that don’t show but still matter. Picasso, Neruda and Parra, Latin American artists that inspire our craft and make us richer and more creative as designers. Their craft has made us stronger as artists and more disciplined as developers. Picasso drew thousands of paintings that didn’t see the light of day. He went undiscovered for years. When he was dying he told friend that he would be remembered by his poetry? Poetry? Yes! Picasso was a poet, and a damn good one! The study of an artist’s life helps us cristallize our own. Latin American artists in particular have a rich production that can lift any artist to new heights. But the key to that grow is understanding the process: how did he come up with that idea? What is he trying to communicate? Drinking from this lake of creation allows us to see the big picture and understand Neruda, Parra and Picasso for what they are: reflections of the Latino culture. By digesting their art we get to see the big picture, we get to experience a new reality. Maybe a taste of Argentina or Chile. The big picture becomes apparent: we are all connected, their art becomes our art and our craft becomes a new lake of inspiration for the region. And that frame of mind drives us, the compromise to create art, to inspire thru design and development, a realization that our work can change lives and enrich their perception of reality. We draw our inspiration from artists around the world. Art in every format serves as a conduit for new ideas. Poetry, paintings, music and sculptures serve as sources of ideas and inspiration for designers and developers. They are like a lake of wisdom that enlightens the mind and breeds a fresh perspective with every glimpse. Founded in the 80s, Pizzarelli is a true Dominican icon. With twenty two fully equipped restaurants and presence in every major mall, this brand needed a solid online image that made justice to its impact on society. 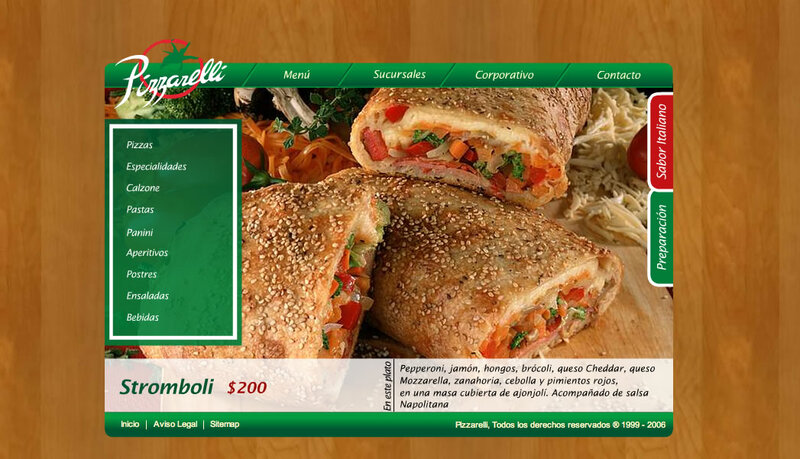 As our second client, we’ve been working with Pizzarelli for a long time and have enjoyed the pleasure of designing the art for their menu, three websites, two intranet applications and several promotional campaigns. More than 80% of the photos where taken exclusively for Pizzarelli’s new website. This, united with a fresh and dynamic design, gave the scents needed for an exquisite digital creation. Good productions have great content. For this one, we revised the whole menu in order to describe each plate in a fresh and new way. Counting on our Flash animation toolset, we created an interactive menu that mixed color motion and sound to create an illusion of nature wrapping the food. Under the hood, many programs very doing their jobs quietly. Dynamic maps, suggestion forms, web statistics and dynamic search that interfaced with Flash programs. Scripting and Flash programming where everywhere in this project. We made extensive use of Actionscript, Asp and Coldfusion. Mixing all these languages in a single interface was a challenge but it was important to deliver the site in the shortest amount of time possible. Data, patterns and historic activity allowed us to craft a comprehensive CRM that works despite intermitent customer contact. The range of animations and novel communication procedures made our projects with Pizzarelli among the most innovative we’ve produced. Night and day, visitors log in to the various Pizzarelli sites and share them on social media, the brand is highly respected on and offline and the traffic has been increasing on a steady pace. A delicious result for a very delicious brand! A New Face for industries and conglomerates so they grow closer to their audience and embrace social responsibility. Very few industrial operators get marketing right. PR and communications are such a challenge for industrials that many times they end up contracting the same project multiple times. This is a terrible scenario for society: citizens are left uninformed unable to tell bad from good actors, and end up choosing inferior products and services. Hence society suffers and the best actors sometimes don’t get to survive. In contrast, an industrial group that communicates well, effects tremendous impact in its immediate surroundings. Therefore, Internet communications and online systems that deliver a clear message, can not only impact the bottom line of factories and companies but also better the life of a whole society. Take for example the situation of Petroquim, one of the largest petrochemical producers of the country. Most neighbors live in constant fear because they don’t know what to make of Petroquim operations. But a website with open tours into Petroquim facilities brings peace of mind to a whole community, offers a new employment alternative and provides a communication device that makes the community and the company even more connected. As a result of a clear communication strategy, Petroquim’s communications with the government and its immediate neighbors improved and its share of international business also increased. Industrials need to give their communication efforts a second look because that is generally their weak spot. However a solid and clear PR and communication stategy will not only benefit the corporation, it will make government’s work far easier and greatly benefit the immediate society of the industrial. Some best practices include: an open email rolodex with contacts to all the key managers, inventory of press releases, virtual tours, monthly newsletters, full product catalog, environmental care guidelines, governmental permits and other sensitive information posted on a transparency section, etc. High hopes for the Internet were displayed by one of the very first industrials we consulted with: Ageport. Private stevedores that manage a sizabe share of the comodities shipments that put in motion our economy. In particular, Ageport transports 90% of the grain used to produce the country’s national beer. Our first mission with this group of great professionals was to create a digital culture in which email and web browsing were used on a daily basis. Next we set to produce a beautiful website that produdly represented the brand and clearly communicated the key messages of the firm. More importantly, we provided realtime tracking services to Ageport customers and downloadable procedures for its visitors. These simple tools make it easy for the company to do business, communicate effectively and bring in more business with almost no additional effort. A clear and simple web presence helps Ageport focus the target of communications around business and shipments. However a more robust communication approach like the one we crafted includes historic information about the company, press releases, online tours and social responsability information. 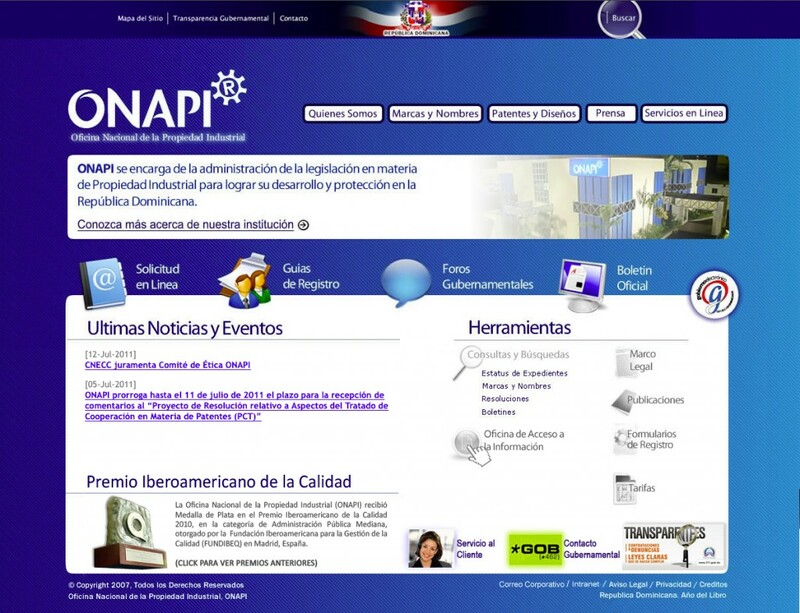 Onapi is the National Patent and Intellectual Property Registration Office of the D.R. We created the first version of Onapi Virtual in 2005 and the second version in 2007. The success of this portal was such that more than 45% of the registrations are now performed online and take less than 20 days to process. This means that companies can incorporate 60 days faster as a direct result of our efforts. Onapi went to went the Presidential Medal of Quality twice and the site was nominated for a Golden @ and exhibited to Latin America and the world via online showcases. The volume of information managed by this site on a daily basis, the social good it brings and the amazing managerial work performed by senior and mid-level leadership make this project a national pride. Since then, the media has heavily reported on the launch and the merits of this website. Not only can Dominican register their intellectual property online, but now international constituents, like managers of Fortune 500 firms or multinational companies can register or query the registration of their company’s intellectual property in the Dominican Nation. The site is compliant with W3C, OPTIC and WIPO guidelines. Onapi’s website is a production of major significance in the history of the Dominican Republic. It is the only website that every other nation must access in order to legally conduct business in the region. Onapi Virtual is the most intenational of all national government websites and is indeed one of the most sophisticated. To put things into perspective, Onapi Virtual houses all the patents, logos, company incorporations, trademarks, and name registrations ever issued by the national government. 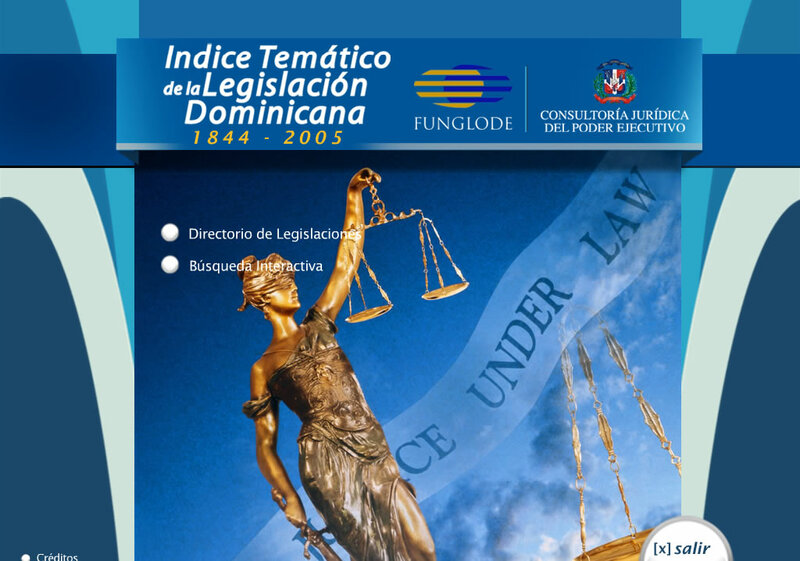 Our work in this project had multiple stages and included the creation of the institutional CMS, the web design of the whole interface, the database connection to legacy systems, online forums, online request forms, departamental websites, transparency forum, web statistics engine and e-government systems implementation as required by law. The complexity of this project was only shadowed by its great success and the positive impact that it had in the Dominican Nation. The merits of the website were chronicled by the media in many articles and also by the President himself when delivering the National Medal of Quality to Onapi. Creating this project had another major impact in the lives of Information Providers’ staff. Now we were the creators of the top entertainment, commercial and governmental websites of the country. It was at this point whre we realised that, as developers, we could become more than simple technicians. We realised we could become a key part of the social fabric of our nation. Designers, developers and producers that lift culture, business and government for the betterment of nations. In this context, the impact of our work was clear, we were no longer building pages but crafting a better future for our country by identyfing the most critical projects and tools we could build. Onapi is a clear example of the key task of every designer: choosing the next project wisely can maximize our societal impact and makes us more relevant in the long term. Our methodology is very comprehensive. We start with a series of discovery meetings, surveys and social processes that allows our designers and developers to accurately discover your most pressing technical needs and , as we build an adequate RFP, every production detailed is mapped to your company’s requirements and needs. We then validate the results of our analysis with internal senior leadership. A “gray site” is a mockup of the whole web production, crafted in detail so key stake holders can appreciate information flow, screen real estate distribution, navigation characteristics, etc. This prototype is clickable and incorporates the point of view of our producer and the project lead on the client side. Typically, three weeks elapse from the initial meeting to the first version of the gray site. Designers then draw the whole site according to specifications and branding guidelines. Soft production means that, at this point, the website is still a drawing and doesn’t yet contain dynamic code or database connections. However, this iteration reflects the final look and feel of the web property. The site is migrated into servers that are comparable to production units. Here performace testing happens as we verify the integrity of the code and the new system as a separate unit. In parallel, client meetings are taking place and multiple versions and adjustments are being applied. At this point, all the key client stakeholders have direct access to the test server and can browse the live site. We direct traffic to the test site and perform multivariate statistical analysis on the production to show whether it converts better than the previous version. It all goes according to plan we might proceed to a release. If not, then adjustments are made and A/B testing is repeated. Statistical analysis is also used to estimate server loads and telecom demands on the clients facilities. Along with the marketing team, we explore the convertion path (usually named sales funnel) of the website. The result of this analysis is a realistic marketing plan that drives traffic to the online property in the best possible way. Sometimes, adjacent properties have to be built to promote the main site: landing pages, social accounts, etc. We craft this web and proceed to market the solution using aggred upon channels. From hereon a maintenance process starts and we keep monitoring the growth and performance of the web properties. Usually the full source code is release to the client and his workforce trained to maintain time-sensitive areas of the product. 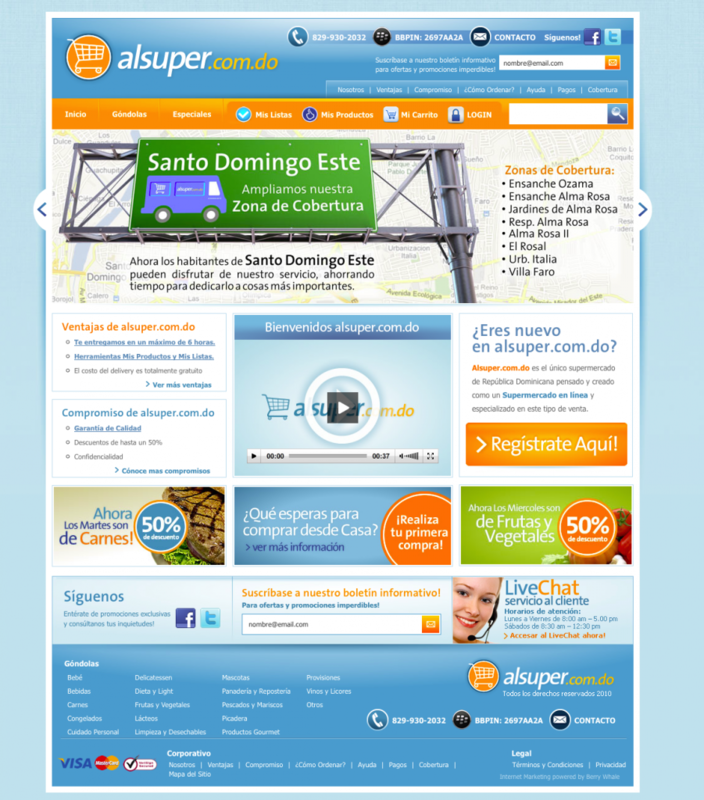 Now the biggest e-commerce site of the Dominican Republic and the Caribbean, alsuper.com.do is redifining the way a whole nation lives. Originally programmed by Jordhy Ledesma, alsuper.com.do now serves tens of thousands of shoppers and delivers groceries to thousands of subscribing families on a weekly basis. With a very simple interface, real-time, inventory management and search facilities more sophisticated than those of Amazon and Google, right from the start we knew alsuper was going to be a winner. But we never anticipated the impact it would have on the lifes of so many working mothers and families. Now customers can save time and money, live a richer life and eat healthier without giving up convenience. Alsuper has become a platform for healthy and organized living that has helped our clientele enjoy life at least a little bit more. Not bad for a single website! With over 100,000 items , alsuper.com.do is the largest e-commerce site of the Caribbean. We syncronize this catalog with current market prices daily and dynamically update inventory conditions and current pricing. This gives visitors an unprecedented experience, the convenience of an Amazon-like catalog with the freshness of realtime sale prices. We tag all the items with several keywords: is the item on sale, how fresh is it, availability, storage unit, etc. By adding complimentary information we give customers the products that they want with the fewest search effort possible. Every week, we analyze search queries and further optimize our listings to showcase whatever customers a looking for in a particular season of location. Wish-lists, shop-lists, previous orders, premade supermarket orders, etc. We use them all to provide a new kind of experience for shoppers: list-based shopping means less travels to the supermarket, more savings, a healthier family and a more orderly life. As a bonus, now everyone in the family can shop for groceries! Viewing web sites across devices is a very common experience nowadays. In other to maintain a consistent branding message is important to present web pages adequately across a wide range of devices. Responsive design is a display and rendering technique that makes possible serving the same page across a wide array of devices. The first step involved in RD is page sniffing or having a program figure out the type of system the page is being displayed in. Afterwards, the page layout will have fluid options so it adapts to vaious screen sizes. However, sometimes toolbars and buttons won’t quite fit on small screens, so their presentation must be crafted in different formats and then code should be written to pick the best option. For example, A/B testing (a form of statistical analysis used to determine the best possible web page layout) is not easy to perform in responsive designs. Web designers must test each webpage multiple times in different environments and usage scenarios. If your budget or staff are limited, is best to stick to proven templates and avoid complex new layouts. However a very well crafted responsive design can save the corporation millions if the traffic to its website is substantial. Having one interface to perform several tasks means less programmers, less support specialists, less documentation and a lesser load on database systems and web services. Responsive web design is a must-have in modern websites. In some instances, a responsive website can ease the production of an iPad app or make possible to forgo it all together. RD increases conversions by raising the familiarity of customers with your brand and establishing a consistent visual language that makes customers already know what to do. A faster loading site crafted with RD in mind allows your company to sell more products with the same capital expenditures in servers and telecom costs. Althought, in time most sites will use responsive design, right now it is a competitive advantage that can save your company millions if well implemented. Strategic projects that move a nation forward can make all the difference. Our collaborations with Presidents enriched these creations. I was contacted by Serigraf, the biggest printing agency in the country, but as unuspecting and aloof as I entered the meeting I quickly gained consciousness: this project is for the President, they told me. As it turns out, the INFOLED system was a key pet project of Leonel Fernandez, the Dominican president at the time. The President has a dream, he dreamt of a nation of hyperconnected lawyers that could browse the entire legal system from their computers without connecting to the Internet. Such a requirement was key as most of the Dominican justice system lacks readily available Internet access. To further complicate the situation, compiling and organizing laws proved to be a gargantuan task, because the legislation encompassed hundreds of thousands of documents that could not fit on a single CD. My work here was as tedious as they come, a dance with compression technologies, self contained search engines and intrincate organizational navigation. We decided to divide the information into “legal systems” or a set of legislation for each industry. In this fashion, every set could fit on a single CD. Replication was the next chapter of this project. But not simple replication, but large scale mass production, with a prevision of five CDs per lawyer in the country. Plus special reserves for Funglode, Serigraf, and the Presidency. Since every CD has to be tested, replication was a massive project in itself. The datastore was bigger than Wikipedia is today, the search facilities where more sophisticated and everything worked in realtime. To this day I have no knowledg of any encyclopedic project as ambitious and useful as INFOLED in all of Latin America. Information Providers is now preparing the next iteration of INFOLED, an online system that can be downloaded at home and used offline with table and smartphone sidekicks. As the first version, these new releases will provide the legislature from 1844 to 2014, almost two centuries of information accesible with a couple of clicks to anyone in the country. Curating the legal body of our country, empowering the justice system to be better informed and more efficient has been a great success for this collaboration. As we finished, I received the highest salutation a professional can aspire to: “This was an outstanding job. Thanks for your service.” said in his own words by the President of the Dominican Republic. Me and my company went on to collaborate with the presidency in other projects but the impact of the firs time always remains. A tour of our most successful goverment projects and how we create a new digital infrastructure that changes the world every second. We discuss impact, standards and e-government technology. Our most impactful work is related to e-government developments. In this respect, we’ve built new standards, won awards, created platforms for international collaboration and national organization among other major things. Jordhy Ledesma has carefully crafted platforms that can stand the test of time by adhering to international standards and pushing the infrastructure of the national Internet forward. We’ve introduced intranet systems, CMS, advanced search facilities, custom made system, Coldfusion data stores, Microsoft .net real-time web services, and new software and designs that make our national government sites world-class. Even the Society for Information has taken notice, nominating our online producer for a global e-government award in 2005. We expect to continue our amazing string of achievements in e-Government in order to accelerate national growth and better life in our region thru practical digital interfaces. What Makes an e-Government Site so Special? Almost a year is required to produce an e-government site, they are among the most complex websites to produce. Agreement from dozens of managers, compliance with many laws and approval from multiple agencies is needed. We test for accessibility, speed, ease of use, content comprehensiveness, advance search facilities and three click information architecture. OPTIC and W3C standards heavily regulate the production of these websites. Excelling at e-Government equals success at the highest ranks of web production. W3C Standards. e-Government websites are the only type in Latin America that must adhere to stringent standards due to international and national regulations. The W3C and OPTIC standards are *ip’s specialty and our adherence to W3C has been applauded several times. State of the Art Document Management. Every governmental website developed by Information Providers has a full repository of all the legislation that is relevant to the institution. Saving visitors time and money and making thousands of pages accesible thru advanced search facilities. As an additional transparency measure, most of our e-government websites include an open government section with all the contracts, bills and critical information. Setting up these systems is a major conquest for Latin America and a great badge of prestige for our firm. Patents. Our online producer programmed and designed the intellectual property registration system of the D.R. ONAPI went to win the Presidential Medal of Honor for this and other innovations. New Principles. We make government social by integrating e-government into the lives of millions. Every major social network has been integrated to make government more accesible to all. Innovation. The Superintendence of Banks’ website was the first government 2.0 property of the region. A massive production that shares the largest financial database of the country with economists and scholars from 93 countries. Finance. Online financial calculators are present in almost all our e-government productions. Mobile. All our productions are ready to be browsed in mobile devices, both tablets and smartphones in a variety of mobile systems. Value. The governmental content follows a strict curation process to bring the best value to citizens. Speed. Sites are stress tested to perform at optimal speed even in slow computers, promoting high traffic. Working for these large group of European institutions helped us grasp the extent of European collaboration in Latin America. With funds from UNESCO, USAID, etc, these organizations create a path of rejuvenation for Haitians and Dominicans alike. We helped by giving them professional images online that capture the nature and importance of their work. As one of the most complicated sites of Latin America, sb.gob.do allows an entire country to protect their financial assets while bringing free information on the Dominican economy to thousands of economists and scholars around the globe. The securities market of the D.R. is online thanks to *ip, siv.gov.do is a prime example of our work. The Superintendence of Pensions’ website displays a design that allows every visitor to reach any piece of content in less than three clicks. As a winner of the Presidential Medal of Quality, ONAPI and its 100% online service policy are the most vivid example of the progress that Latin America has made on e-Government productions. We are glad to have designed a website that has won so many awards across forums. The Confederation for Dominican Employees is one of the most dynamic websites that we’ve produced. Embeded TV channel, online forums (both public and private), realtime CMS, search facilities and a document management system keep this site fresh and updated to the minute so workers can be more efficient and demand their most current rights. The treasurer of the social security system of the Dominican Republic is one of the most security conscious organizations in Latin America. Working with Unipago to produce their corporate website meant rising to higher standards of production to comply with their demands and keep our country secure. The National Bank for Housing is one of the finest Dominican institutions in existence. BNV provides housing for millions of Dominicans. Jordhy Ledesma led the production of this nationally crucial website that now serves hundreds of thousands of inquiries in a monthly basis. The BNV site has been so successful that the media constantly reports on its merits. Self-contained legal system to help lawyers navigate the justice system on their own. This was the first website for any Dominican First Lady, so indeed a major responsibility for our firm that turned into a nice presentation card for our services in the future. Value driven design and development have guided Information Providers since the very beginning. Our culture is one of societal compromise and constant achievement. But we can’t be entirely profit driven, such a path limits our potential for social impact. Hence, we strive to be the best and help impactful institutions as much as our business endeavors allow us. Pro bono work has been an important componet of the growth of our firm and is quite certainly a distintion from our competitors. The list of *ip pro bono work recipients includes: The Codespa Caribe Foundation, IDDI, UNESCO, ADOARH, Miss Universe, The Dominican Math Olympiads, Funglode, The Dominican Presidency, The Dominican Dispatch of the First Lady, among others. Helping our immediate community is an important part of our DNA. However our charitable work has also had global impact in the form of open source software translation of key programs of the open source movement. Ning, Farcry CMS, WordPress and Rainbow Portal were translated to Spanish by Jordhy Ledesma, taking the contributions of our work to international shores. Translations. Our Ning social platform translation was quoted by Marc Andreessen, the inventor of the web browser. Criteria. We choose recipients based on mutual benefits and potential for societal and global impact. Enter the world of cross continental contributions and you’ll understand the strategy of the European Union. By helping countries in the path of development the EU accelerates the economic growth of some of its key partners with the most efficient capital expenditure possible. One of these projects is the PRIL (a program that fosters civil communication in the DR). The EU contracted *ip’s services to maintain and bolster the presence of this critical program that is targeted directly at the civil community of the DR and Haiti. PROEMPRESA is another EU program that contracted *ip’s service thru open tender and tasked us with the created of the largest small business portal of the Caribbean. Hosted by Verizon, the ePymes portal was one of our greatest achievements of the last decade, one that got hundreds of thousands of visitors and substantial media attention. The distinguished ONFED program also contracted our services to enrich the set of online tools available to small business owners in the Caribbean. Small business owners in the Caribbean have a big impact in European big businesses. For one, they are the suppliers of exotic produce and art that are highly demanded in Europe, and they provide touristic and industrial alternatives at such a competitive price that EU businesses can’t easily replace them. The selection of these strategic small businesses was initially very hard. Officers of PROEMPRESA wanted us to craft websites for three thousand small businesses, however such a task is not sustainable in the long term. Is best to educate the businesses so they become online conversant and then able to use email, social networks and search engines. Then the biggest ones can apply for a website. After a rigorous selection process we ended up working with a handful of impactful small businesses for which we created an onsite development process. Small business owners would then be able to come to our offices and learn about various things related to web development and online tools. What was the Geographic Impact of this Initiative? Small businesses with operations in DR, Haiti and Puerto Rico were impacted. Big businesses, restaurants and supermarket chains in Europe, Asia and the Americas were also very impacted. Online ordering means that the global supply chain of tropical and exocit produce is cut in half and the whole process becomes more reliable. What is Next for the EU And Online Initiatives in the Region? PROEMPRESA was a two year program that ended up running for four years.Hundreds of similar aid programs are still in operation and Information Providers is proud to contribute in many of them. Perhaps the most notable, the PRIL program is a long running communication program that seeks to enable the civil society at large to use online tools and become more productive. Jordhy Ledesma has been a key consultant in the project and is working towards maintaining the quality and relevance of content that empowers small business owners and professionals across the region. The tools and services created by the PRIL are among the best of the country and they are generally provided free of charge to small business owners and entrepreneurs. These tools and information systems enrich the business relation of any country that transacts with the Republic. *ip is very glad to be an important part of this information revolution that keeps pushing us forward. 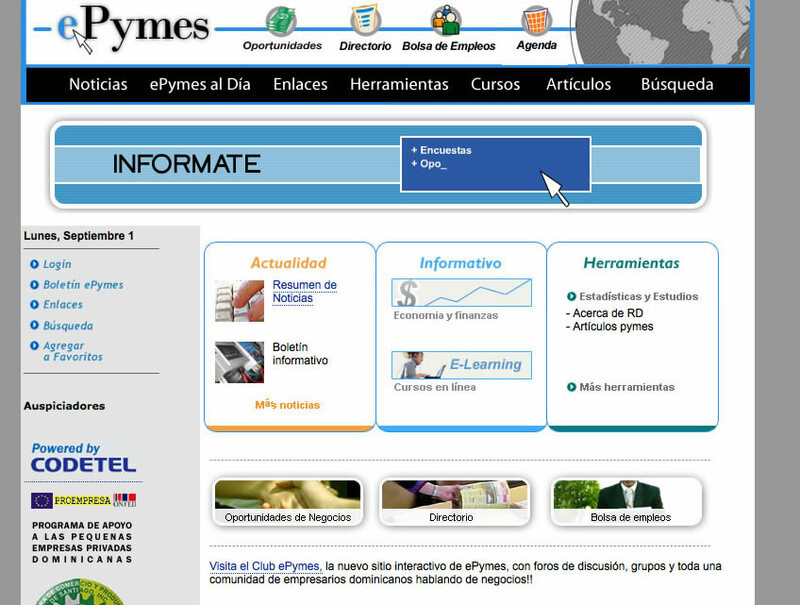 ePymes was the first Coldfusion portal of the DR. The technology allows for dynamic PDF generation, interactive form presentation and Verity search. The sophistication of this systems allowed for the presentation of tens of thousands of documents from which the entrepreneurs could choose. The system also allowed for multi-lingual deployment and realtime announcements. Verizon made this possible by donating several servers in their data centers and giving us full control over them. We went on to program on one of the most complex hardware platforms of the Dominican Internet. In such a state of affairs our firm was compelled to excel and deliver very creative solutions to tough communication problems. We made extensive use of Flash animations, ActionScript, some .net technologies, Java, compression technologies, Verity Search, Outlook integration and MS Office dynamic document generation. Products from Macromedia, Adobe, Microsoft and Oracle were instrumental to our achievements. e-Pymes’ launch had a broad impact in the small businesses of the region. Both residents of Santo Domingo and Santiago regularly access the site to complete various managerial tasks. As a result, the EU commissioned the development of more portals and several indicators grew significantly including funds requests, online visits, company creations (within the PROEMPRESA program) and so on. Today, most small businesses in the DR file their taxes online, register their brand names and logos using the web (in another portal we developed) and generally use the web browser as a natural tool. This benefits European businesses greatly because now they can interact with Latin American suppliers in a very swift fashion. The impact of the Proempresa, PRIL and ONFED programs thru the technical efforts of Information Providers have increased the speed of business in the region and given businesses across Europe the benefit of dealing with local providers without using the phone. The most succesful of these local businesses, RG Global uses a website developed by *ip and processes monthly shipments of tropical foods and delicacies in the order of tons of produce that enrich life in Europe, the Americas and Asia. Like RG Global, the online tools and services developed by *ip have impacted the live of millions of Americans, Europeans and thousands of local business owners. Our principal answers five critical questions about Information Providers. On occasion of our 12th anniversary. 1. Would you do anything differently if you were to start from scratch? Definitely no. Information Providers encompasses a world class group of designers and developers that fulfill my creative vision everytime. As online producer I can’t think of a better team to realize my vision for the Latin American Internet. We have made a lot of mistakes but eventually we grew stronger because of them and that is also a very important part of the journey. We are like a big architecture firm in which the vision is brought to reality by hard work and obsesive care over the details. And I’m very glad to have crystalized such a culture. 2. Which design has been your best if any? My best design is the one I will do tomorrow. I expect the best of myself and my team and everyday new technologies come out that increase our possibilities and broaden our global reach. I want to offer that new array of possibilities to each and every one of our clients. 3. What is the key to producing award-winning websites? Like Hillman Curtis said: “We make visible the invisible”, when representing big global firms online is key to find the soul of the message and the needs of the recipient. Only then can we architect an online dialog that serves both the needs of the audience and solves the pain points of the brand. Then technical mastery and detailed communication play an important role. We don’t always get it right but I’m very proud of our track record. 4. What excites you in technology right now? Crypto-currency is the next frontier. We have already produced so many apps for the iPhone and tablets and Bitcoin now looks like the next frontier. Latinos need a cheap way to send money to their relatives in Latin America so crypto will be a big hit in our region. We’re already deploying bitcoin-ready websites and we have a partnership with large crypto-currency miners and developers in London and the USA. 5. What is next for Jordhy Ledesma and Information Providers? International expansion. We are in the process of opening up our consulting and development practice to serve a large number of Latinos in the US and the EU. This requires a lot of paper work and due diligence but it’s well worth the effort. For example, there are more Dominicans with access to the Internet in NYC than in the D.R. A presence in America means we can serve the needs of millions of Dominicans and Latinos that need our services. Casandra winners Ruby Perez and Aljadaqui chose *ip to craft their online presences. Jordhy Ledesma managed the image of these stars to conquer and even wider audience using *ip’s proven methodology and top notch design techniques. The highlight of our creative endeavors in the entertainment industry was our site for Anima Studios, an Arroba de Oro finalist and the most widely recognized 3D animation portfolio of the Caribbean. All brought to life by the magic of *ip’s online production team. It says a lot about your work when distinguished designers choose you to portrait their history of accomplishment. As designers we were very selective, says Gina from Anima Studios, but eventually we realised that *ip was the best choice for us. Jordhy Ledesma and Information Providers have sponsored the Miss Universe National Pageant in D.R. four times (a record for any web development firm), our commitment to beauty and excellence have earned us the nick name of “Online Producer of the Tropical Beauty”. The Miss Universe portal in the D.R. has been the most visited site on the country on three ocasions. And it’s been a joy to work with beauty queens, master photographers and international fashion designers. Our firm truly grew larger after these experiences. Active development in the entertainment industry remains a core part of our DNA and further productions in this area will be announced shortly. Accessed by users in over 93 countries, the Superintendence of Banks has one of the most advanced websites of any Latin American Superintendence. This website has five self-service centers, a dedicated TV program that also airs on national TV, the biggest financial database of the Dominican Republic, online financial calculators, multiple news rooms, realtime search facilities and multiple staging and testing servers for each financial dataset. As one of the largest websites of the country, the press heavily reported on our achievements and, since launch, traffic has doubled, making this one of our most successful e-government productions yet. Citizens will now have a useful tool to file their financial claims and inquire about their credit cards and other financial instruments. Economists and educators the world over now have a stable and comprehensive financial information repository to report on whichever business cycle the Dominican Republic is experiencing.